TELAR es un proyecto dirigido por la diseñadora de modas y tejedora Summer Romero. Es un proyecto inclusivo que se pretende realizar en diversas comunidades e ir cambiando de sede, formando y expandiendo la red social. La sede actual de TELAR es en Mexico D.F. desde donde se colabora con Oaxaca, Hidalgo y pronto la Sierra de Puebla. Todo artista y artesano es bienvenido a colaborar mediante TALLERES y RESIDENCIA ARTISTICA en la sede donde se esté desarrollando el proyecto. TELAR i s project directed by fashion designer and weaver Summer Romero. Is an inclusive project that is meant to be developed in various communities and change location site, creating and expanding a social network. TELAR is now being developed from Mexico D.F. colaborating with communities in Oaxaca, Hidalgo and Puebla. 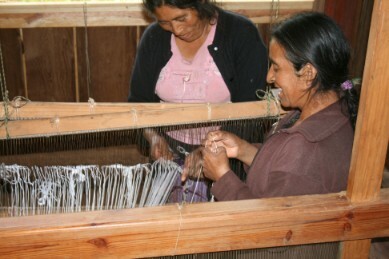 From March 2010 to Oct. 2011 was developed in San Sebastian Rio Hondo, Oaxaca. The work was done at TALLER SHAWE also collaborating with Ecovillananda ( EVA ). through an ART RESIDENCY anywhere where theproject is being developed. In every location a physical space called TALLER SHAWE is open for the exchange of techniques,expression, knowledge, education, art practices, art therapy, and experience in textile art, inviting other art disicplines to collaborate(video,sound,music,photo,painting,performance,etc..
TELAR invites all collaborators to make pieces under the practice of "PROGRAMATION IN ACZION."